To close out the year, four Central Coast companies are holding screenings of environmentally conscious films as part of EcoWatch! Movie Nights 2018. 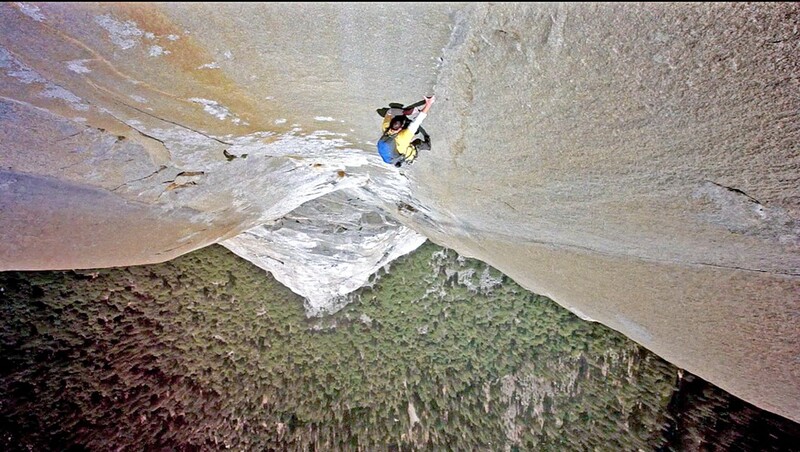 CLIMBING UP A rock climber ascends a granite face in Yosemite National Park in the film Valley Uprising, which will be featured on Nov. 29 as part of EcoWatch! Movie Nights at Green Goods in San Luis Obispo. "We choose films that may cover 'eco' or 'green' topics, including water quality issues, natural resource preservation, animal protection, waste issues, globalization, recycling, and sustainable agriculture," said Mikel Robertson, co-owner of Green Goods. He said that his sustainable living construction firm joined forces with other San Luis Obispo-based businesses including Ten Over Studio and Purlieu Landscape Design, along with the Morro Bay-based All Good. All the companies involved, with the exception of All Good, provide services related to eco-friendly and "green living" construction, design, or landscaping. All Good is known for organic pain relieving creams, lip balm, and similar wellness products. "We've all been working in our community together building green homes and businesses—both in the interior of the building and the exterior landscapes," Robertson said. Almost naturally, the companies started advocating for green solutions such as rainwater harvesting, the responsible use of gray water, drought tolerant landscaping, the use of nontoxic and sustainably sourced materials, as well as the need to create and celebrate sanctuary spaces. It's why the four firms decided one of the best ways to get out their shared vision of a more environmentally conscious community was to screen films revolving around current environmental conditions across the globe. "We want to engage audiences in issues, threats, and hopeful developments in shaping their children's future," Robertson said. "We will focus on one topic each evening and share a simple solution or activity that individuals or families can incorporate into their lives at home and use the movie they watched as inspiration." On Nov. 15, they held their first screening in the yard in front of Green Goods' parking lot. The movie aired that night was Tomorrow. Released in 2015, the French documentary explores potential concrete solutions to a rapidly changing world due to climate change and human population growth, coupled with urban and rural development. At least two more film nights are set to be held on Nov. 29 and Dec. 6 from 6 to 8:30 p.m. at the same location (111 South St.) in San Luis Obispo. The last November film is Valley Uprising, which takes a deep dive into how the rock climbing culture in Yosemite Valley developed into the world-famous extreme sport it is today. The last film, airing on Dec. 6, is called Given, the only movie that's not a documentary. It follows a young boy from Kauai and his family traveling and surfing across 15 different countries. What follows is a story that reveals a young man opening his eyes to the raw, powerful, and yet fragile world that surrounds him. The events are free to attend on any night. Prospective patrons are advised to bring warm, comfortable clothing, folding chairs, and "inspired minds." Visit the EcoWatch! Movie Nights event page on Facebook for more information. • Hope's Village and Paso Cares have passed 85 RVs to local homeless veterans and others as part of the five-year RVs for Veterans program. Common Ground Worldwide—a North County based nonprofit that works to assist homeless people and others in need—is now managing the program, according to a press release from Becky Jorgeson with Hope's Village. Learn more about Common Ground by visiting commongroundworldwide.org. • Sierra Vista Regional Medical Center and Twin Cities Community Hospital partnered with San Luis Obispo County and the Sierra Mental Wellness Group to place employees who are specially trained on mental health in emergency departments at both hospitals. The goal of the initiative, according to a press release, is to help manage the behavioral challenges faced by the community. It's a vital service for patients experiencing mental health emergencies, the release states. Sun Staff Writer Spencer Cole from New Times' sister paper wrote this week's Strokes & Plugs. Send hot tips to strokes@newtimesslo.com.